Fast and comprehensive changes, that have become a decisive feature of the our times, necessitate rethinking of the underlying foundations of human existence in the world. Technological innovations, social shifts, climate change, economic freedom, growing stream of information, and the fluidity of public institutions – these and other factors articulate the issues of finding meaningful ways of life and a decent role in the society, reassessing values inherited from previous generations. The Ideas Festival is an open forum for leaders, a place for in-depth study of ideas and problems, a place to shape ideas and thoughts on a decent and happy life of a person in a rapidly developing world. The Ideas Festival includes panels of more than 100 speakers, more than 100 different sessions of various formats and themed areas – from lectures and presentations to discussions and face to face conversations – these all create a unique atmosphere of intellectual exploration. The mission of the festival is to unite the efforts of thinkers, leaders of public opinions, business leaders, territory communities, artistic associations, charities and other communities, allowing them to exchange ideas and find ways to apply the best of them in practice. 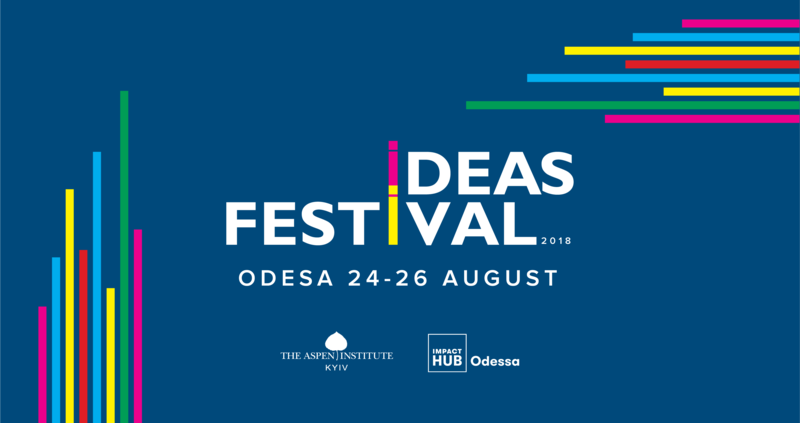 Co-organizers of the Ideas Festival are Impact Hub Odessa and Aspen Institute Kyiv.